Most of the drivers will only be concerned with the normal operations of their windscreen wiper blades at the front of the car, very few actually actually take notice of the rear windshield wiper blades. In fact, not many people actually use their these wiper blade at the back of the car until they need to. The rearscreen wiper blade is actually as important to the driver as those in front. Though drivers are more concerned with their visibility in front, it is also important to know that a clear view of the back of the car is needed while driving. Due to the obscure nature of the rear window wiper, many car owners tend to neglect it and not take care of it. They usually fail to notice that it is time to replace the wiper blade until its too late. To know when to replace the rear wiper blade is simple, you just have to note if the swiping is clean. If the blade is leaving streaks of water after swiping, then the rubber has probably worn out and needs replacement. Rear windshield wiper blade is usually much shorter compared to those in front. Front wiper blades are typically 16 inches and above in length, those at the back are only 11 to 14 inches. They are also cheaper than their longer counterparts. You can get one for less than $10 easily. You can consider rubber or silicone wiper blades, their comparison can be read here. Check the condition of your rear wiper blades today and replace it if necessary. Do not wait until you are driving in thunderstorm to know that you need a clear view of the back of the car. Blind spots are dangerous, so try to reduce it when driving. It is all in the name of safety. Driving during winter has always presented a different set of difficulties for drivers compared to summer or spring time. This problem is mainly due to the sub-zero temperature that the car is exposed to during the whole season. Besides having to change to tires for more surface grip, drivers also have to remember to switch your wiper blades to one that is more for winter use. It is all in the name of safety because wiper blades not made for winter will malfunction when you need it and this will affect your visibility when driving. Most of the wiper blades used by cars are actually made of rubber, these will function normally during spring and summer. However, once we enter winter, the performance of rubber deteriorates rapidly because this is not a material that withstands cold as well as silicone. The rubber wiper blades will become stiff when exposed to freezing temperatures. The stiff blades can do more harm then good, not only will it not able to clear away the snow and particles on your windscreen, in worst cases, it might even scratch your windshield. With so many problems associated with using with using rubber wiper blades, what should you be looking for when considering a winter wiper blade? First of all, the wiper blade has to be made of materials that can withstand the harsh temperatures in winter. This is to prevent it from hardening. A common material used for winter purpose is Teflon-like. This will not freeze and still be able to flex to swipe the windshield clean of snow and particles. Moreover, such blades have a protective coating on the its frame that prevent snow and ice from forming on it. It is recommended to change wiper blades every 6 to 9 months, so your normal wiper blades should last you through the year before changing to the safer winter purpose ones. If the old ones are still in good condition, you can keep it and switch back again after the winter season. Most wiper blades have a lifespan of 6 to 9 months before you will see the need to replace it. Silicone blades usually last longer than rubber wiper blades. However, the lifespan is largely dependent on how you use the wiper blades and maintain it so you could get your money’s worth. Most drivers will find it a convenience to use the wiper blades and swipe off any residues they see on their windshield. However, swiping on a dry surface has detrimental effects on the wiper blades. Dry surface will produce more friction when swiping wiper blades and this causes more wear and tear to the blades. This problem is exacerbated during a hot weather. The UV rays is already damaging enough to the blades. The additional heat will damage the wiper blades faster. You also should not use the wiper to remove dirt and grime accumulated as these grainy materials can wear off the blade edges faster. It is also not advised to swipe ice or snow on the windscreen as these will cause deformity to the blades. Snow is also heavy and causes much stress to the whole blade system. Most of the damage done to the wiper blades are due to it operating in dry and hot conditions. All it needs is windshield washer fluid to make swiping smoother for the blades. You can easily purchase one bottle of washer fluid from gas stations. Mix it into the storage tank located under the bonnet of the car. Though wiper blades are cheap accessory, it plays an important part in driving safety. Do not wait until its worn out before you realize the need to change. The best way is to use it appropriately to prolong its usefulness. Not only is it cost efficient, it also gives the driver a peace of mind. It is often a split decision drivers have to make a choice between buying silicone or rubber wiper blades to replace their worn out ones. A key consideration will be the price difference between these two materials. Silicone made blades are usually more expensive, by about 20%, compared to rubber made blades. However, we would think that there is more to price to think about when choosing a replacement wiper blade. Wiper blades may be a small accessory to the car but its reliability and performance will have significant repercussions to the driving experience. Imagine you are caught in a thunderstorm or a snowstorm, your wipers are unable to clear the windshield properly, leaving you to drive under bad visibility. Bad wiper blades can endanger your life. Rubber is mostly made up of a compound of natural and synthetic rubber mixed with other chemicals. It is a common and low cost material used throughout the world. Silicone is an inert material, meaning it is stable and durable. It is typically used in high stress equipments such as sealant and cookware. A key property of Silicone which makes it useful for wiper blades is its stability under extreme temperature change. This makes it useful for all seasons in a year. It is also resistant to UV rays. For cars in the tropics, your wiper blades will often be worn down by the sun and has to be replaced often. With silicone wiper blades, you can be sure of a longer lasting performance. Rubber wiper blades are noisier and produces a screeching sound when they slide on the windscreen. On the other hand, silicone wipers has natural lubricant ability that helps a smoother slide. If you can afford that extra buck, go for silicone made wiper blades since it provides so many benefits not available by rubber based ones. Though you may not realize it but the windshield wiper blades you use can affect the aerodynamics of your vehicle when it is in motion. Wiper blades that are not streamlined or well in contact with the surface of the windscreen will cause more drag while moving and decrease the overall efficiency of the vehicle. The implications of this includes more fuel consumption and a reduced driving experience. The increased drag caused by wiper blades can be attributed to the Windlift phenomenon. This is due to the moving air getting under between the wiper blades and the windscreen surface. It provides an upward force on the wiper blades, thus pushing it away from the surface. By having the wiper blades jutting outwards will affect the overall aerodynamics of the vehicle. It causes a distortion to the flow of air and add to the resistance of the car moving forward. Windlift is just the reason that caused the drag of the car but what are the factors that cause windlift? There can be a few but we will highlight the more prominent ones. Firstly, this could be due to design of the windscreen of newer cars. As more manufacturers design windscreens that are more curved to improve the aerodynamics, the downside is that conventional wiper blades will not be able to have a full surface contact. Just imagine placing a straight pole against a curved surface, there is definitely space allowance on either end. So ironically, this new windscreen design will cause more air to deflect off it and push the wiper blades outwards. This has in fact reduced the efficiency rather than improve it. Secondly, the problem could also lie with the design of the wiper blades. Older framed wiper blades are very rigid and stiff. The latest wiper blades in the market are designed aerodynamically that will mold itself to the windshield. The spring tension at the arms of the wiper blades will also affect the amount of contact with the windshield surface. If there is not spring tension, it may not hold the blades in place and consequentially, loosen the contact with the glass surface. Choosing the right wiper blades to fit your car is a small but important task, If possible, spend that premium to get better designed wiper blades that will resist windlift and give good wiping performance. Safety is paramount compared to aerodynamics. Michelin has once again introduced its revolutionary new technology it its wiper blades. The Michelin Stealth Wiper Blades has been very well received by automotive users with its high performance cleaning of windscreens and reliable use. What most car owners want in their windshield wipers is to be able to clear the rain or snow from their windscreen and not leaving any streaks behind. Low quality or worn out wiper blades will cause water streaks across the windscreen, hampering the view of the driver in low visibility environment. This can be dangerous and we strongly recommend getting the Michelin Stealth Wiper Blades for a safer ride. So what has Michelin invested in their technology to create this reliable product? Get The Michelin Stealth Wiper Blades For As Low As $12. What Does STEALTH Hybrid Mean? The Michelin Stealth Hybrid technology refers to combination of the Beam blade and the Traditional Blade used as windshield wipers. The characteristics of Beam blades include aerodynamic design and anti-snow build up. The Traditional Blade has excellent windshield contact and is spring loaded. The Michelin blades boasts the best of both worlds by combining them into a single package. Good Aerodynamic Performance – The sleek design of the Michelin Stealth Wiper Blades will compliment the overall appearance of any vehicle. In fact, it is so well designed that it protects the wiper frame from debris clogging underneath it. Its smooth aerodynamic design will not add to the air drag of the moving vehicle, causing it to be inefficient. To install the Stealth Michelin wiper blades is a simple task that any car owners can execute. The product comes with an EZ Lok Connector system that users can easily release and click on to your latch. Make sure that you hear the ‘clicking’ sound indicating it is locked in place. The Michelin Stealth Wiper Blades are available in all lengths starting from 16 inches to 28 inches. Michelin Wiper Blades are priced reasonably and it is definitely a good investment even if it costs slightly more over other similar wipers. For the low price, you will get a high performance wiper blades that will last you through any seasons. Goodyear Premium Wiper Blades with SilentArmor technology are made with a natural rubber compound using steel frame, double-painted components. Its unique wiping edge has a round-hinge profile for more efficient wiping. Goodyear Premium wiper blades are durable with a silent wiping action. They are available from 11” through 40” for a wide range of vehicles from passenger cars through to trucks, buses and RVs. It is available at Amazon for half the retail price. View List Of Goodyear Wiper Blades On Sale Or To Read More Reviews Here! 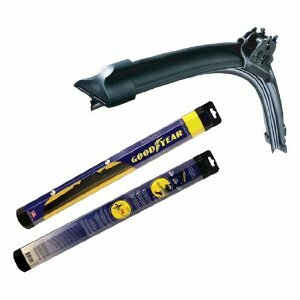 Goodyear Assurance is a heavy-duty wiper blade with ‘beam’ or premium flat design. It features the company’s unique SilentArmor and ResponseEdge technology for optimum, all-weather windshield wiping power. Its spoiler material is designed to repel snow and ice. Goodyear Assurance wiper blades come with unique connectors compatible with the latest OE designs. They are available in sizes from 14” through 28”. Full Range Of Selection Here. Goodyear Racing is a high performance wiper blade. Its wiping element has a round-hinge profile for better wiping performance. This wiper blade which uses SilentArmor technology has integrated functional spoilers which ensure optimal windshield contact at any speed. Goodyear Racing is available in sizes 15” through 28” for light truck and passenger car applications. Goodyear Racing Winter Wiper Blades have a heavy-duty, riveted steel frame, stainless steel flexors and functional spoilers for maximum windshield pressure at all speeds. In addition this unique winter product is fitted with a winter boot which repels snow and ice. It features exceptional durability and wiping action relying on SilentArmor technology. Goodyear 20/20 Performance Wiper Blades are made of natural rubber in a riveted frame with stainless steel flexors. The Goodyear 20/20 Performance series is available in sizes from 11” through 28”. Goodyear produces some of the best wiper blades and they can be bought online from Amazon, Ebay or Craigslist. However, you need to know how to change wiper blades if you were to buy it on your own. You may also want to consider Trico Wiper Blades Reviews as comparison to Goodyear. Trico is one of the world’s oldest manufacturers of wiper blade systems, wiper blade replacements and wiper blade refills. The company has manufacturing plants in all five continents. Trico manufactures wiper blades, refills and complete assemblies to suit virtually any vehicle on the road. Here is a brief overview of thei Trico Wiper Blades Reviews. Beam Wiper Blades offer superior performance because they are protected with a Teflon coated, hinged shell. The different models in the Trico Beam Blade range are as follows. Trico Force Wiper Blades are a robustly engineered product with a swept-wing spoiler for high speeds and a VorTec aerofoil for maximum windshield contact. This HighGlide treated rubber blade offers a smoother, quieter wipe. 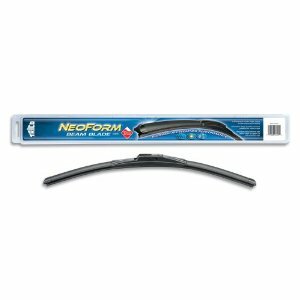 Trico NeoForm is a premium wiper blade which provides uniform pressure and a clean wipe through its Memory Curve Steel beam. Its unique dual-point coupler is specially designed to prevent streaking. The NeoForm is available at Amazon with Free Shipping. Trico Teflon Shield Wiper Blades offer the superior wipe of a beam blade and the protection of a hinged shell casing. The rubber wiping element is infused with the Teflon surface protector to ensure a longer life with a smooth, silent performance. Trico Tech is a cost-effective, advanced flexible beam wiper blade with all-weather durability. It is designed to last for over 1.5 million cycles. Trico Exact Fit Beam Wiper Blades specially designed to make maximum contact with the modern car’s highly curved windshields. Their memory curve steel beam assures uniform pressure for the clearest possible wipe. Trico Exact Fit Conventional Wiper Blades are easy-to-install, conventional metal blades which provide original factory quality. Trico Chill Wiper Blades have a protective rubber boot which prevents the wiper from being clogged by ice and snow. They are designed for exceptional performance in extreme weather conditions. These blades are robustly built with a durable metal frame for heavy duty applications. Trico Chill Teflon Edge Wiper Blades have an exclusive surface-protected wiping edge which provides a longer, smoother life with a quieter wiping action. In addition, these wiper blades have all the other features incorporated in the Trico Chill Wiper Blades. You can visit the official Trico Blades website for other products. Streaking of the windshield happens when the rubber of the wiper blade has dried, hardened or cracked. Worn rubber which can be seen as rounding of the leading edge of the wiper blade. This indicates that the blades have served their useful life. Chattering of the wiper blade along with a juddering motion happens when the rubber has developed a ‘permanent set’ or ‘curve’. A permanent set indicates that the blades have become warped as a result of having been parked too long and not used. Split and torn blades are the effect of ozone and ultraviolet rays on the rubber of the wiper blades. The rubber becomes brittle and develops cracks which split and tear after some time. Shredded rubber blades happen when there is excessive play because of worn or loose fitting adaptors. If you are experiencing any of the problems described above, the solution is to replace your wiper blades. Another common irritant is excessive noise when the wipers are in operation. The way to tackle this is to inspect your wipers. Very often the problem might be as simple as dirty wiper blades. The answer is to clean the wiper blades with a solution of baking soda and liquid washing soap in warm water which generally takes care of the noise. If the noise continues, check that the wiper blades are properly seated in the adaptors. If you have recently changed your wiper blades check that they have been properly installed using the correct adaptors. If there is a problem here you might have to replace the wiper blades or use the proper adaptors. If you are still experiencing problems with your wiper assembly it could be because of a damaged or bent wiper arm or improper pressure between the wiper blades and the windshield. You might like to check the arm assembly and the linkage to identify the source of the problem. If the arm is bent or the wiper blade is broken, your only solution is to replace the assembly. Even the Best Wiper Blades will succumb to the external elements. Therefore, it is advisable to replace wiper blades at least once every year though most motorists don’t do this. Wiper blades are constantly exposed to sunlight and varying weather, and have to contend with harmful pollutants, dust and debris. After a time, any wiper blade becomes brittle and begins to tear. The result is poor wiping leaving streaks and worse, could even scratch your windshield. Experts recommend changing windshield wiper blades every six months to a year for optimal performance. You can replace the whole wiper assembly for best performance or you can replace the set of blades with refills which is a cheaper alternative. Refills are available for virtually all standard wipers. When buying a wiper blade replacement it might be a good idea to use the old wiper blade as a sample to make certain of the correct size. If you are deciding to buy online then check the car manual for the exact specification, or search for wipers by car make and model. Most wiper blades come with adapters which fit on practically any kind of connector. There are various different types of wiper blades available. A silicone coated, natural rubber blade will give you better and more lasting performance. Other new blades made of rubber compounds too give you more life. What Tools Would I Need to Replace Wiper Blades? The only tool you will need when replacing wiper blades is a flat head screwdriver. What are the steps to take to replace a wiper blade? Move your wipers to an upright position using the ignition. Place an old tee shirt or cloth on the windshield to protect it if anything should accidently drop on it. Turn the wipers out. If you are using wiper blade refills, first remove the old rubbers which you are planning to replace. They might be secured with snaps and tabs which you will have to open out to release the blade. Slide in the refills and secure the snaps and tabs so the wiper blade refills are firmly secured. If you are changing the wiper blade, remove the old wiper blade first. Every kind of wiper will have its own method of fastening the wiper blade which might be a hook or snap which can be opened with a screwdriver. Most likely this will be illustrated on your new assembly. When you fit in the new assembly, reverse the process so that it is firmly secured to the arm. In some vehicles the wiper blade is different for the driver and passenger side. Make sure you are fitting the correct one. Check your wipers using the windshield washers. Make sure the blades are secure and sweeping effectively.